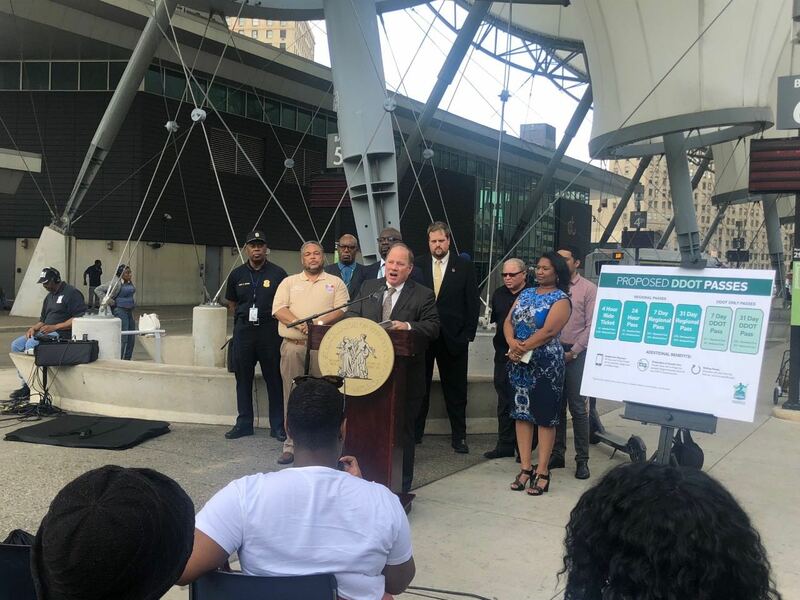 Detroit Mayor Mike Duggan and DDOT and SMART officials announce proposed fare changes at the Rosa Parks Transit Center. Soon, Detroit Department of Transportation (DDOT) and Suburban Mobility Authority for Regional Transportation (SMART) riders will not have to deal with paper transfers that break machines and fumble with loose change to pay for bus fare, according to officials who announced proposed fare and transfer changes Thursday at the Rosa Park Transit Center in downtown Detroit. The proposed changes are designed to make using the region’s primary transit systems much simpler for riders. The proposed changes will streamline the fare system for riders by eliminating all transfer fares, allowing for seamless transfers between the two systems using new 4-hour, 24-hour, and 31-day regional passes, reducing the number of passes from 25 to six easy, flexible options, and eventually adding a mobile fare payment app and additional retail location for tickets. A new mobile phone-based pass purchase option will allow riders to purchase and store the new unlimited regional 24-hour and 31-day regional and DDOT-only passes right on a mobile phone. After the initial release, DDOT and SMART will coordinate efforts to add additional passes to this new mobile option with the goal of all passes being available later in 2019. The proposed changes aim to provide simpler choices and more flexibility for bus riders in Detroit and across the region. Riders can provide feedback and comments on the plan at community meetings and public hearings over the next three months. The proposal will go before Detroit City Council for approval in November. Pending approval, fare changes would be implemented starting December 1. Any adjustments to SMART’s fares will require approval of SMART’s Board of Directors. DDOT and SMART are working together to allow seamless transfers between the two transit systems. The proposed 4- and 24-hour passes, and new regional pass will let DDOT riders use the same base fare ticket to transfer to SMART, ending the need to carry extra change or an additional pass just to pay for the transfer. DDOT and SMART officials say ending the fares for transfers also will reduce boarding times and eliminate confusion among bus drivers and passengers. Consistent with SMART’s current practice, DDOT 7-day and 31-day passes will be no longer expire at the end of the week or month. Passes will be active for the full 7 or 31 days starting on the first day of use. Weekly and monthly passes that have rolling times rather than fixed dates will give riders the full value for their money. Joseph Powell is a frequent transit rider and is currently sharing a car with his wife. He was a bit skeptical about the rumors of a price hike for DDOT, since he rides the Woodward 53 and Seven Mile 45 a lot but was pleased with the proposed methods the two transit companies are trying to implement for smoother rides. Student riders (under 18 years old) will see a reduction in fares, to 50 cents from 75 cents on DDOT and $1 on SMART, and seniors 65 or older, Medicare card holders and individuals with disabilities will enjoy all of the new benefits at the same price, with no increase. Complete information on the proposed fare changes can be found at RideDetroitTransit.com.